Lighthouse Number 1 Hand Lantern manufactured from Dietz. Front view. Hand lanterns were issued to each lighthouse in a set, a number one and a number two hand lantern marked as such. Pictured to the left is a number one hand lantern. Lanterns were marked so as to not get them confused with the other style when they were needed. A keeper could say "get the number one lantern" and anyone he asked would know which one to get. One person has stated that this type of lantern was hung in the lantern room above the lens as the keeper was lighting the lens lamp for that evening and was readily accessible if the light were to go out. It could be hung in view of the water in the lantern room. This was a back up if something were to happen to the main lens lamp to temporarily get the light out while re-lighting or repairs were made to the main oil lamp. Another person has mentioned that they were just normal hand lanterns for everyday station use since no electricity was available at the time or in later times in case the power did go out. Other household lanterns and outside lanterns did exist we know. As with all objects in the lighthouse service, it was marked with a US Lighthouse Service Plate as seen in the photographs. This was one of the few items that the lighthouse service purchased from outside vendors as they made themselves most everything they needed. We have also learned something about the lanterns from a person at www.dietzlanterns.com. A #1 lantern has a #1 burner in it which uses a 5/8" wick. A #2 lantern has a #2 burner and uses a 7/8" wick. The #1 lantern will burn approximately 30% longer than the same size lantern equipped with a #2 burner. Light output is also reduced approximately 30% as well. 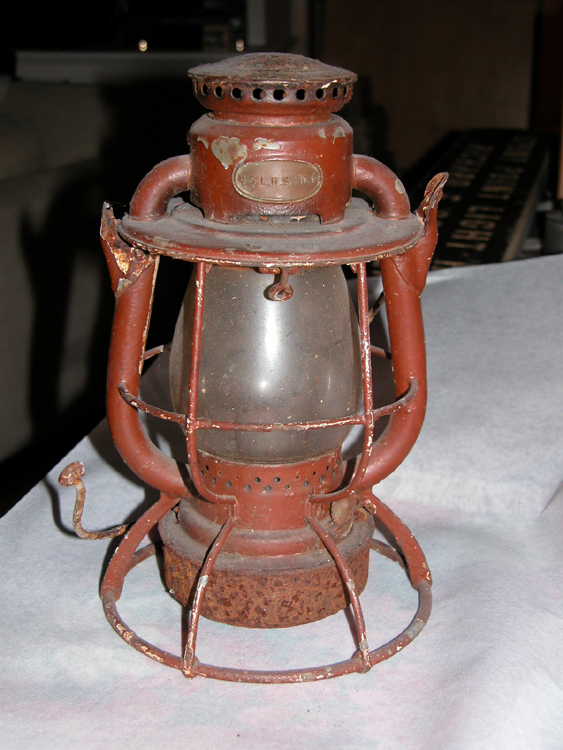 The Dietz #1 Blizzard lanterns were only made from 1898 to 1908 and are infinitely more rare than the #2 version. The #2 Blizzard lanterns have been made in continuous production since 1898 and is now produced in the Dietz factory in China on the same tooling that has been used since day one. They moved the production from New York in 1956. If anyone has any further information about these lanterns please contact us. 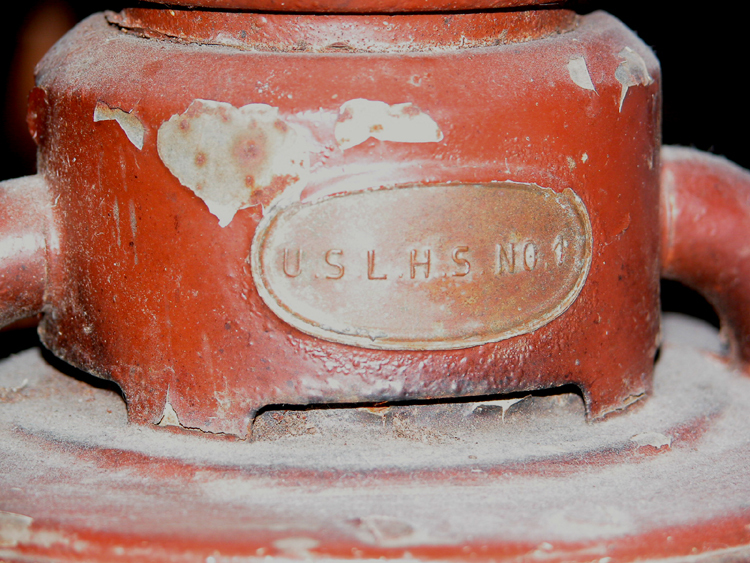 Close up of the lighthouse service tag on the front of the lantern with the initials U.S.L.H.S. NO.1 located on the top of the lantern. Copyright © 2001-2005 Michigan Lighthouse Conservancy. All rights reserved.